It was a 10 hour flight from Chicago on Turkish Air, and every seat was full. Because of the 7 hour time difference, it was 3:15 pm when we arrived. (actually 15:15 – locals operate on a 24 hour clock). We purchased our $20 pp visas (yes, Tom, you CAN get them upon arrival!) and waited 30 minutes for our free transfer to the hotel. The ride in took about 30 minutes — lots of construction and modern structures. I was struck by the Marmara Sea, where huge cargo ships were everywhere! Istanbul straddles the Bosphorus Strait, and there’s a big port on the Asian side of the city. It was similar to a Lake Shore Drive, except the Sea is on the right and an ancient wall stands to the Old City on the left. What a difference when we drove through the wall — small cobbled streets and wall to wall buildings. Very quaint! 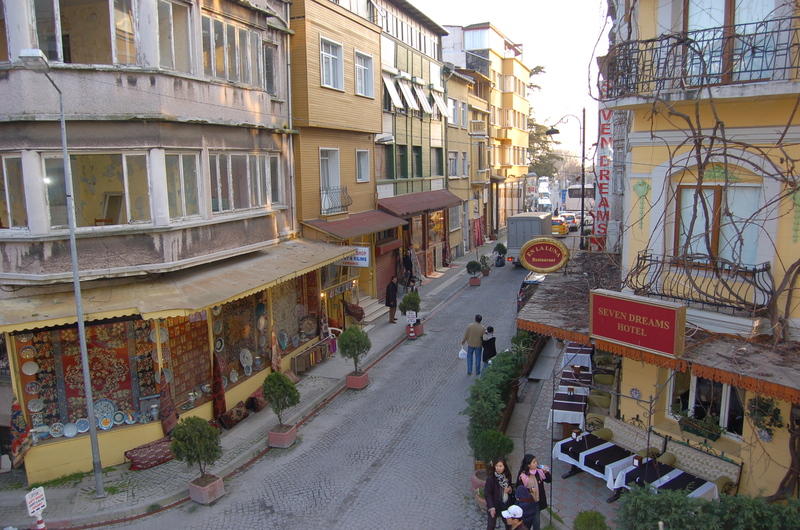 Our hotel, the Uyan, is a quaint 29 room boutique hotel in the Old City, Sultanahmet. The rooms are TINY , but clean and very nice. Inlaid tile floors in the common areas are lovely, and the rooms have pine floors with Turkish area rugs. Lizzie’s and my room has a balcony overlooking the street (the second floor balcony, if you look at the Uyan website). We passed an incredible open air fish market on the way in, and Tom is in the mood for fish from the Marmara Sea. The kids won, though, and we’re going to try a hotel-recommended Turkish restaurant tonight –” very popular and not much money,” according to our very efficient and courteous front desk clerk. First, though, I have to wake Lizzie, who’s sleeping for the first time in 26 hours.